Sunday March 10 1907 I did up the morning work and we went down home for dinner. Otts folks were there. Spent a very pleasant day. Father felt some better today. Will came home at four oclock but I did not come till five. I wrote some in the evening. The snow about one. Monday March 11 1907 I had churning to do so did not attempt to wash. I was busy with the house-work most of the forenoon. I went down to Mr Dons store of an errand and then up to Mrs Robinsons. I did some work on my [towel?]. It was raining some when I came home. A letter fro Lydia and one from Will Work says Esther [Thurber?] is dead at Ottawa [Kanses?]. Tuesday March 12 1907 I was busy with the work all forenoon The boys are getting up the wood. After dinner I went down to George Wartens of an errand and stopped at Mrs. Ed [Kozers?] till supper time. 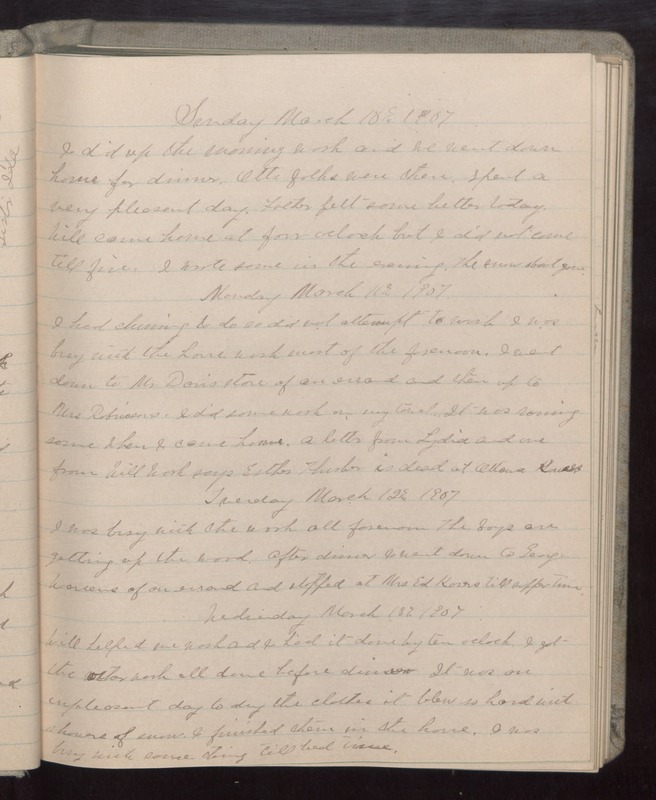 Wednesday March 13 1907 Will helped me wash and I had it done by ten oclock. I got the other work all done before dinner It was an unpleasant day to dry the clothes it blew so hard with showers of snow. I finished them in the house. I was busy with some [cleaning?] till bed time.